Notes: Dunstanburgh Castle is a 14th century fortification on the coast of Northumberland in northern England, located between the villages of Craster and Embleton. The castle was built by Earl Thomas of Lancaster between 1313 and 1322, taking advantage of the site's natural defences and the existing earthworks of a former Iron Age fort. Thomas was a leader of a baronial faction opposed to King Edward II, and probably intended Dunstanburgh to act as a secure refuge, should the political situation in southern England deteriorate. The castle also served as a statement of the earl's wealth and influence, and would have invited comparisons with the neighbouring royal castle of Bamburgh. 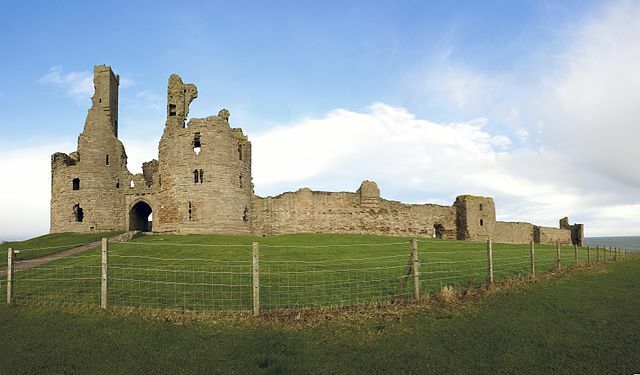 Thomas probably only visited his new castle once, before being captured at Battle of Boroughbridge as he attempted to flee royal forces for the safety of Dunstanburgh. Thomas was executed, and the castle became the property of the Crown, before passing into the Duchy of Lancaster. Dunstanburgh's defences were expanded in the 1380s by John of Gaunt, the Duke of Lancaster, in the light of the threat from Scotland and the peasant uprisings of 1381. The castle was maintained in the 15th century by the Crown, and formed a strategic northern stronghold in the region during the Wars of the Roses, exchanging hands between the rival Lancastrian and Yorkist factions several times. The fortress never recovered from the sieges of these campaigns, and by the 16th century the Warden of the Scottish Marches described it as having fallen into "wonderfull great decaye". As the Scottish border became more stable, the military utility of the castle steadily diminished, and King James I finally sold the property off into private ownership in 1604. The Grey family owned it for several centuries; increasingly ruinous, it became a popular subject for artists, including Thomas Girtin and J. M. W. Turner, and formed the basis for a poem by Matthew Lewis in 1808. By the 1920s, the castle's then owner, Sir Arthur Sutherland, could no longer afford to maintain the property, and he placed it into the guardianship of the state in 1930. When the Second World War broke out in 1939, measures were taken to defend the Northumberland coastline from a potential German invasion. The castle was used as an observation post and the site was refortified with trenches, barbed wire, pill boxes and a mine field. The Dunstanburgh Castle golf course was built around the property in 1900, and expanded by Sutherland in 1922. In the 21st century the castle is owned by the National Trust and run by English Heritage. The ruins are protected under UK law as a Grade I listed building, and are part of a Site of Special Scientific Interest, forming an important natural environment for birds and amphibians. Dunstanburgh Castle was built in the center of a designed medieval landscape, surrounded by three artificial lakes called meres covering a total of 4.25 hectares (10.5 acres). The curtain walls enclose 9.96 acres (4.03 ha), making it the largest castle in Northumberland. The most prominent part of the castle is the Great Gatehouse, a massive three storey fortification, considered by historians Alastair Oswald and Jeremy Ashbee to be "one of the most imposing structures in any English castle". Multiple rectangular towers protect the walls, including the Lilburn Tower, which looks out towards Bamburgh Castle, and the Egyncleugh Tower, positioned above Queen Margaret's Cove. Three internal complexes of buildings, now ruined, supported the earl's household, the castle constable's household and the running of the surrounding estates. A harbour was built to the south east of the castle, of which only a stone quay survives.